An intellectual filter in bhakti refers to giving our intelligence the role of arbiter in deciding what is acceptable and what isn’t. But the intelligence may well filter Krishna out of our heart, deeming him as irrational or mythological. Why? Because Krishna sometimes performs feats that may not make sense to our logical-skeptical intelligence. Actually, his ability to perform such deeds simply proves his supremacy – if he truly is the greatest being, then he must be greater than our intelligence. So in principle, he can’t be caught or conquered by our intelligence, that is, he can do things that can’t be comprehended by our intelligence. Acknowledging the trans-intellectual omnipotence of Krishna is not a rejection of the intelligence, but its perfection. It requires great intelligence – intelligence strong enough to resist the seduction of the ego – to acknowledge that it is subordinate to God. The Bhagavad-gita (15.19) declares that those who worship Krishna wholeheartedly as the Supreme Person are the most intelligent. While an intellectual filter can be a pitfall in bhakti, an anti-intellectual filter can also be a pitfall. Some practitioners may equate any intellectually demanding study of scripture with the jnana-marga (the path of knowledge). Further, they may deride as jnanis (dry intellectuals) those who go deep into philosophical technicalities. However, such simplistic denunciation of the intelligence is misinformed because philosophical technicalities have been analyzed by many of the greatest devotee-acharyas. 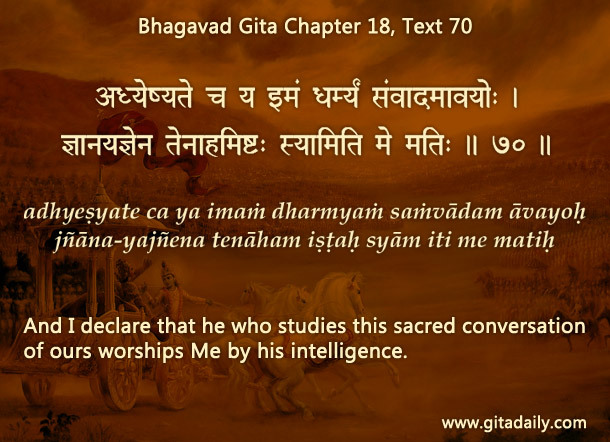 Further, the Gita (18.70) declares that those who study its message are worshiping Krishna with their intelligence, thereby revealing the right role of the intelligence in bhakti – not as a filter, but as a facilitator. We use whatever intelligence we have for appreciating Krishna’s glories; better understanding ourselves: our nature and conditionings; and improving our personal application of scripture, thereby firmly marching towards Krishna.